In this post, I will show you how to quickly access relevant information via the Today view. This rule applies to physical (paper clips, scissors, …) and digital (a folder, a document, an app, information like the weather, …) things. Since iOS 7, Apple has been gradually implementing and improving features that allow us to access information more efficiently, and one of those is the Today view. Very quickly, you can see the weather forecast, your next appointment, your reminders, and oftentimes information that you did not suspect to be available until you try to configure it. At the heart of it, the Today view is a collection of “widgets” that you choose to display or not and which can be ordered and customised to your liking. 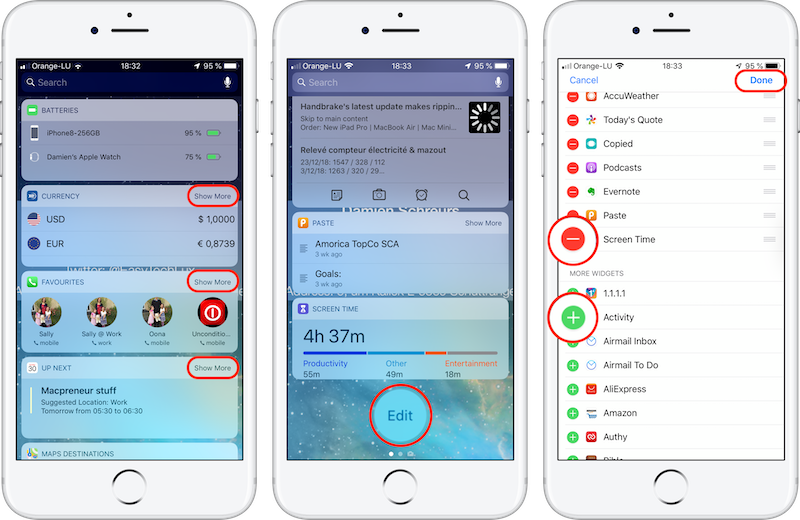 Apple provides a series of widgets as part of the operating system and you will find additional widgets for third-party applications too, provided that the app developer created one. The Today view is available for iPhone running iOS 7 and up, but to be able to customise it, you’ll need iOS 8 and up, available only for the iPhone 4S and later models. Or swipe down from the top edge of the screen (top left corner on iPhone X/XR/XS/XS Max) then swipe right. Tapping on a widget will open the app and in the case of Calendar, tapping on an appointment will open it directly. For some widgets, you'll see a "More" button that, when tapped, will expand the widget's information. When finished, tap on done (top right corner). And you, how often do you access the Today view on your iPhone?